Offering a holistic take on an emerging field, this edited collection examines how heroism manifests, is appropriated, and is constructed in a broad range of settings and from a variety of disciplines and perspectives. 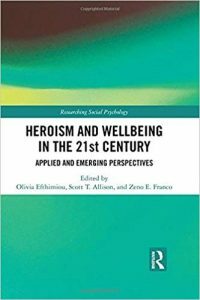 Psychologists, educators, lawyers, researchers and cultural analysts consider how heroism intersects with wellbeing, and how we still use-and even abuse-heroism as a vehicle to thrive and prosper in the everyday and in the face of the most unbearable situations. Highlighting some of the most pressing issues in today’s world-including genocide, racism, deceitful business practices, bystanderism, mental health, unethical governance and the global refugee crisis-this book applies a critical psychological perspective in synthesizing the social construction of heroism and wellbeing, contributing to the development of global wellbeing indicators and measures.